The following returns policy applies to all items sold on alltastesgerman.com via Adoria Media LLC. 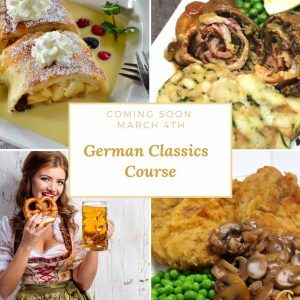 We want you to love your All Tastes German Online Cooking Experience! If not, we are happy to accept refund requests or course exchanges for our online cooking experiences purchased on our website within 14 days as long as you did not download or print any content. Just can reach out to us via our contact form. Please let us know the reason for your refund request, we want to know how we can improve our online cooking experience portfolio. Thank you! If you are not fully satisfied with your purchase, return it. It’s easy! Contact us to request a return. You must make this request within 30 days of purchase. Please specify the reason for the return request in your message. Use the Upload File button to provide digital images of damaged or defective products. Provide us with a valid email address, order ID, shipping & billing address and your phone number.